Investigation into the concept of cloud computing has been completed (see section below) and highlights the potential benefits of abstracting the computing resources from the hardware. One area where this approach could have some short term benefits is the R&D environment. This project aims to demonstrate how the concept of cloud computing can be applied and used to provide a flexible hosting environment which can be accessed both through a web browser and programmatically in order to provision and manage the underlying technical resources. We approached this project by looking at available software which would enable us to provide a self service provisioning interface with our present virtualisation technologies. 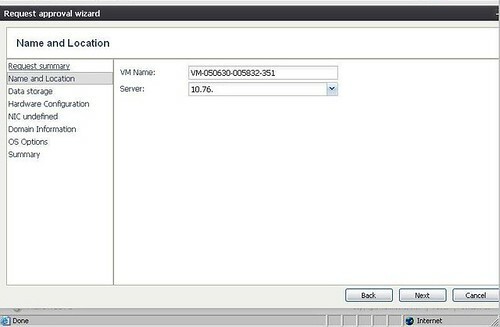 The application we went with was Vizioncores vControl which claims to provide a web interface that can manage VMWare ESX, Microsoft Hyper-V, XEN and Solaris Zones. 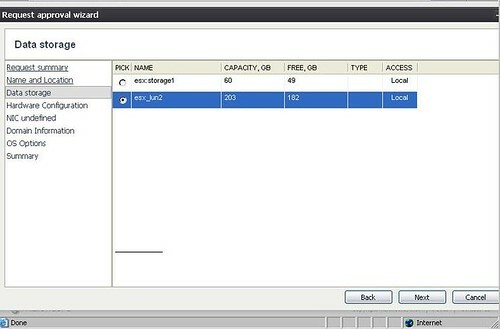 To test this we provisioned three HP proliant DL 380 servers. 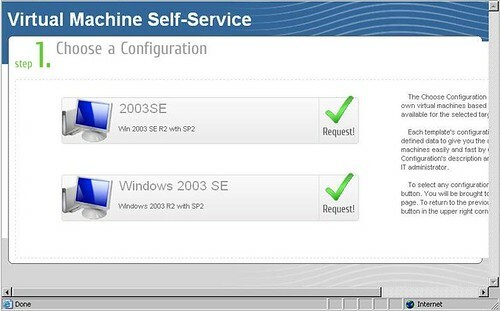 We installed Windows Server 2003 with Virtual Center and Vcontrol on one box, ESX server on another and Xen on a third. 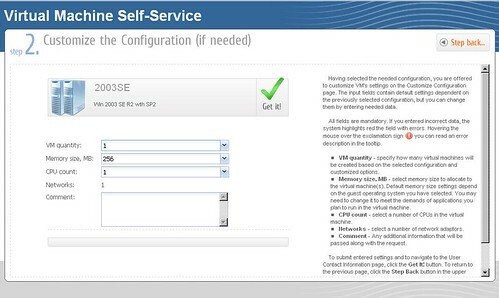 We then went through the process of creating a few Windows 2003 templates on the ESX host and tested out the self service provisioning functionalilty of Vcontrol. The following slides show the simple four point process of selecting a template server by a user in a web browser. When the request has been completed the requester software sends an email to the Administrator. 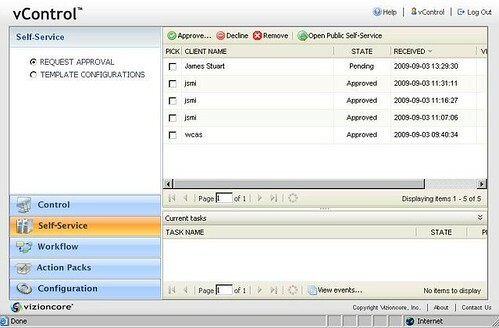 The Administrator then makes any necessary changes to the request before approving the request which is then made by the system from a pre-designed template. The requester then fills out his details. The fields need to be filled in. Basic error checking ensures details added are in a valid form. Followed by any changes needed to CPU, memory, hard disks etc. The second part of this project was to look at the increasing use of the term internal\private cloud, what it means, the reasons behind it and its implications. 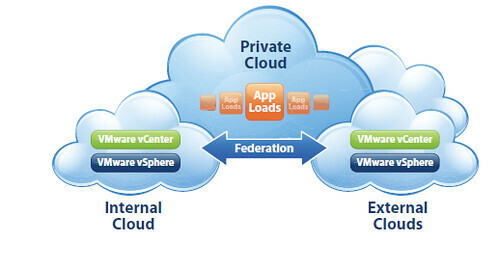 The widespread adoption of virtualisation technology has enabled data centre administrators to become service providers to meet the needs of their customers and a internal\private cloud is used to describe a virtualised environment that provides hosted services to a limited number of users from behind a firewall. The reasons behind building a private cloud are control and security, companies want it within their own firewalls and they want the ability to have full control in managing the environment. 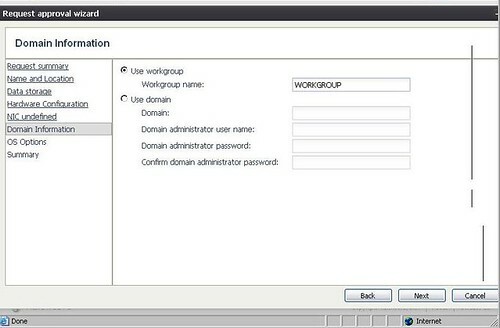 Another reason is that enterprise customers can't just lift and load applications and run them in isolation in the cloud since a majority of the enterprise applications are connected to backend systems (eg SQL databases) and internal authentication servers (eDirectory or Active Directory). Should work with existing physical and virtual resources in the data centre (heterogeneous platforms and operating systems). Should let you specify whether your applications are virtualised or not (due to vendor support on some applications if virtualised). Provide additional capacity on demand (elasticity). Should not disrupt existing software architecture (no modifications should need to be made to make it work which may break the software). Should be segregated to to support both production and development environments. Would provide internal metering and billing for internal users\directorates. 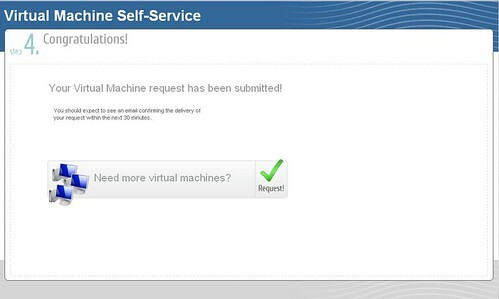 Self Service provisioning of servers. 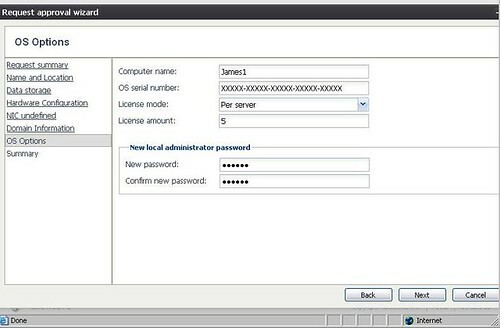 The ability to maintain internal audits and prevent sensitive data from being hosted externally. Having a secure seamless connection between corporate data centres and the servers in the cloud will help reduce the barrier for enterprise customers to gradually move applications in the cloud without having to worry about the integration issues between internal resources and resources in the cloud. To address this VMWare are introducing vCloud which partners VMWare with over 100 service providers including Rackspace and Terremark who are using VMWare technology to offer internet based computing clouds. Vcloud will connect internal data centers and external service providers together with potential uses being disaster recovery, infrastructure as a service or an increase in capacity. This approach does have clear benefits, you don't have to learn new interfaces, you can transfer existing VMs and their VMDK file images and get the benefits of load balancing, high availability and vmotion. We demonstrated in a short period of time that it was possible via a simple web interface to provision virtual servers from pre-configured templates. However we could not get the application to work with XEN due to the specific version of XEN that is required (and not currently available from Citrix's website). 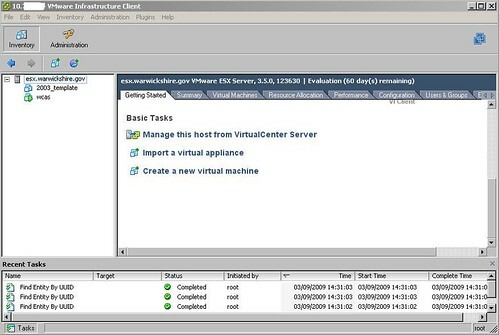 The product although free, offers limited functionality, for example the cloning aspect for ESX servers requires Virtual Center through which you can already clone VMs. It is $399 per host processor if you want to use the self service provisioning functionality which is expensive for the basic functionality it provides. The limited number of applications and the high cost of this environment (requirement for Virtual Center) must be considered against the short time in which the project had. The fact that this emergent technology can be used in a few days to get 'A Private Cloud' up and running shows that this is a useful and challenging area of research and that more work looking at other providers may show a more cost effective and feature rich environment. 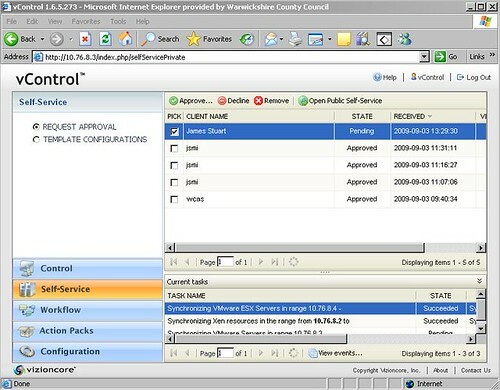 vControl could be trialled as a management interface for Hyper-V running on server core, the alternative methods would be via Windows Vista, Windows 7 or another server that is running the full GUI version of Windows Server 2008. 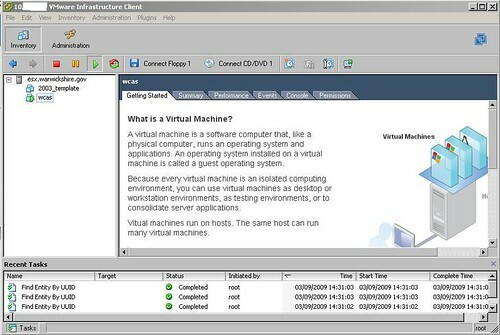 Vizioncores Vcontrol like Microsoft Systems Center Virtual Machine Manager is trying to provide an application that allows you to manage multiple virtualisation platforms from a single point. 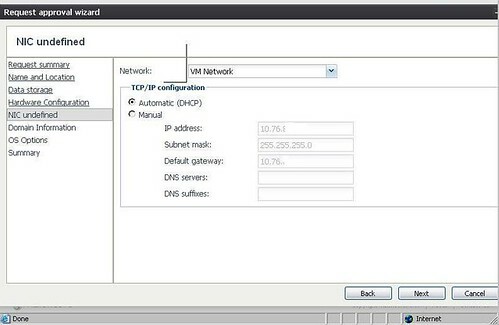 However the functionality they provide depends on having VMWare Virtual Center which they plug into. 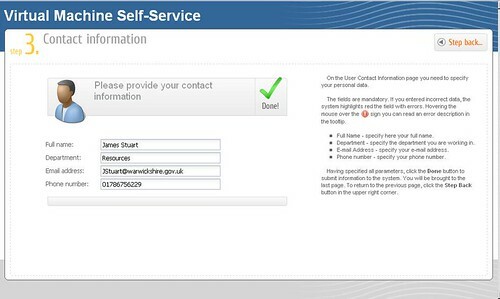 At the moment vControl adds very little functionaility with the self service provisioning website. The benefits are; that it allows a user to visualise what is available from the pre-provisioned templates, this gets submitted and then requires administrator approval. Our current approach is to get the customer to fill in a form based on the minimum specification they get from the suppliers which the administrator then provisions based on templates. 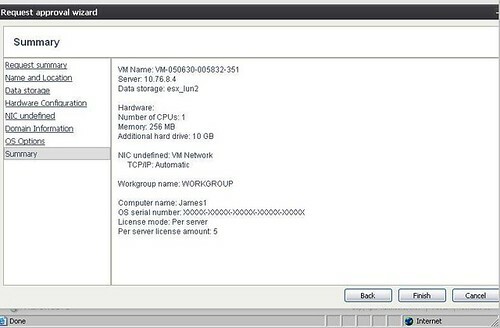 vControl does offer other benefits that we have not yet had time to explore, for example task based automation, however this would require work on developing workflows and actions, for example if more memory is required an automated task could be created to power down a VM, add more memory and then power on the VM after business hours. The use of 'A Private Cloud' could help to make the provisioning of virtual servers easier and require less input from highly skilled staff. The rapid growth of virtual servers has shown a weakness inherent in the system, i.e. if it is very easy to create virtual servers they will grow at an almost exponential rate. To resolve this you need three things. The first is knowing what you have got. 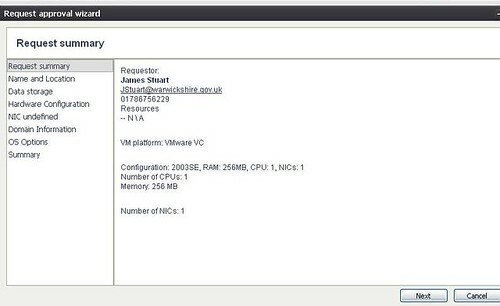 A product like Virtual Infrastructure Discovery feature of vControl helps 'VM administrators discover hosts and VMs that exist within an identified IP range helping them quickly identify and include infrastructure resources'. Controlling the spread of VM files used by developers and testers on the network also needs some consideration. Then you need to be able to keep the system running in an efficient manner for example to reduce the size of VMs and condition them. 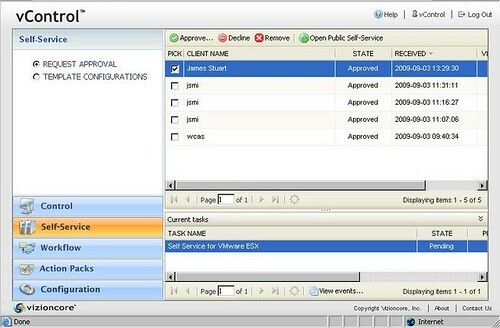 vControl also has a utility to do this called vOptimizer Pro. 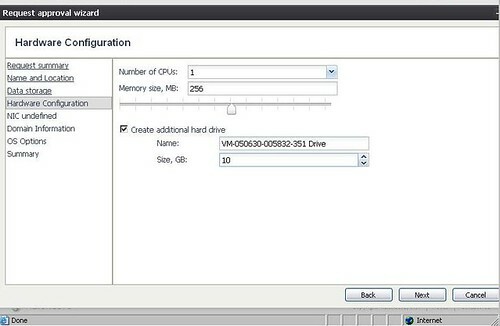 Finally you need to rationalise the virtual server farm and remove unnecessary VMs. As time goes by this last point will become more of an issue as the disk space used by out of control VMs is potentially huge.